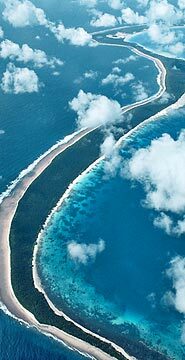 Chagos is an Indian Ocean island possession of the UK, one of the colonies it held onto after decolonization. Britain evicted the native Chagossian population and leased the island to the U.S. military. Now Diego Garcia is one of the most important bases in America’s empire of bases. British courts except for the House of Lords have ruled in favor of the Chagossian’s right to return to their homeland, but the government has fought them every step of the way. Now the UK is proposing a marine reserve for Chagos. A nice environmentally friendly move, you might think. However, this designation could block the return of Chagossians and prohibit fishing in the reserve. The Brits may have stolen this play right out of the U.S. play book: using marine environmental protection to dispossess the native people. The U.S. has created federal marine monuments in the Northwestern Hawaiian Islands and is proposing a similar monument in the Marianas. While the Papahanaumokuakea National Marine Monument has created unprecedented protections for the coral reef system in the northwestern Hawaiian islands, the Bush administration slipped in an exemption for the military to conduct its activities within the reserve. The proposed Marianas marine monument contains similar provisions. Native Hawaiians have generally supported the Papahanaumokuakea National Marine Monument and have helped to shape it to incorporate subsistence fishing and other cultural practices. Chamorros have been divided on the Marianas monument because any increased federal control means an erosion of the islands’ sovereignty and native rights. With the proposed U.S. military expansion in Guam and CNMI, the federalization of the marine ecosystem is viewed with warranted suspicion. The U.S. military has realized that being environmentally friendly can have strategic value. Undeveloped nature reserves are less troublesome as neighbors of military bases and ranges than complaining suburban residents. So the Pentagon instituted a conservation buffer program to partner with environmental groups to preserve areas bordering bases as a way to prevent the “encroachment” of other users. Marine reserves that allow military activities to take place without competing users serves the same purpose. If ever there was an oceanic treasure worthy of conservation, the Chagos archipelago, with its crystal-clear waters and jewelled reefs, is it. Yet the British Government’s plans have split the gentle world of marine conservation, created a diplomatic row with Indian Ocean states and turned the spotlight on to the archipelago’s place in Britain’s darker colonial history. The British Indian Ocean Territory, as it is officially known, is the ancestral home of the Chagossians, the 2,000 people and their descendents that Britain removed forcibly from the islands in the Seventies to make way for a US air and naval base on the main island, Diego Garcia. Despite Britain repeatedly overruling court judgments in their favour, the exiled Chagossians have continued their struggle. This summer their case will be heard at the European Court of Human Rights in Strasbourg. By then, however — if David Miliband, the Foreign Secretary, gets his way — the Chagos will have been designated a marine protected area (MPA), where activities such as fishing and construction are banned, denying them any legal means to sustain their lives. It is, depending on your view, a sinister trick to prevent the Chagossians returning; an easy piece of environmental legacy building by a Government about to lose power; or an act of arrogant imperialism to rob the territory’s true owners of any say in its future. Perhaps the most compelling case against the plan, however, is made by the swelling cadre of environmentalists opposing the project in the belief that — far from protecting this pristine paradise — it could hasten its destruction. “Even if I didn’t care about human rights, I would say this is a terrible mistake,” said Dr Mark Spalding, one of the world’s foremost experts on reef conservation. Mr Miliband will begin to examine the cases for and against the reserve next week, after public consultations ended yesterday. A decision is expected within weeks, but the Foreign Secretary already sounds convinced. “This is a remarkable opportunity for the UK to create one of the world’s largest marine protected areas, and double the global coverage of the world’s oceans benefiting from full protection,” he wrote. Many of the world’s leading conservation groups have thrown their weight behind the proposal, which emphasises the advantage of the islands being “uninhabited”. They are not: the original islanders were removed from Diego Garcia to make way for a military base that houses 1,500 US service personnel, 1,700 civilian contractors and 50 British sailors. The island, which constitutes 90 per cent of the landmass of the Chagos, is, in effect, to be exempt from the protection order. Peter Sand, a British environmental lawyer who has investigated the US base’s impact, has documented four jet fuel spills totalling 1.3 million gallons since it was built and has lobbied unsuccessfully for information on radiation leakage from nuclear-powered vessels there. “To say that a small group of Chagossians could have a greater impact than the base is just crazy,” Dr Spalding said. The plan has also sparked a diplomatic row with Mauritius and the Seychelles, from whom the Chagos Islands were taken and to whom Britain has agreed to cede them when they are no longer needed by the US military. Britain faces further embarrassment over allegations that Diego Garcia was used to moor US prison ships where “ghost” prisoners were tortured.